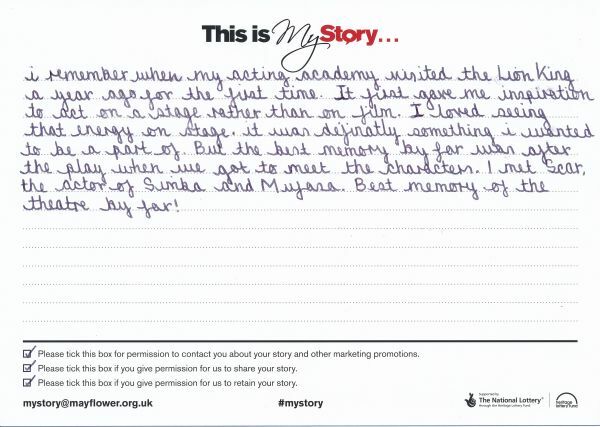 My Story card: Anvi Deshpande remembers seeing the actors of Lion King when she saw the show. I remember when my acting academy visited The Lion King a year ago for the first time. It first gave me inspiration to act on a stage rather than on film. I loved seeing that energy on stage. It was definately something I wanted to be a part of. But the best memory by far was after the play when we got to meet the characters. I met Scar, the actor of Simba and Mufasa. Best memory of the theatre by far!